snowdeal.org > ex machina: the season of giving. someone, somewhere must have studied the varied kinds of gift givers. there are those that give because that's what's "expected". and then there are those people like myself who think about all the great gifts that would be perfect for this person or that person but never get around to getting it all together and end up feeling a bit guilty about their lack of holiday gift giving execution skills. and then there are people like peep's mama ( and here ) who manage to put together a perfectly perfect box of gifts. not only did she and her family send odin a SCHOOOOOLBUS! 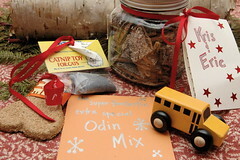 and a "superfantastic odin mix" cd filled with her son jack's ( a fellow micropreemie ) favorite songs, but they also included a big ol' treat for mauja and truck and...and...US! we've never even met "in real life" so i'd like to know how she knew that skor candy is one of my favoritest kinds of candy. even though she claims to not be a good explainer in her directions, even a dolt like myself can follow along and i'm totally going to steal the idea. thank you amy, andy and jack. it's perfect.